Q: "Hi everyone, I'm trying to transcode my JPEG2000 mkv file to H.265/HEVC with FFmpeg but it gives me some errors and I have no idea on how to get it to start encoding the video. Any suggestions?" FFmpge is an open source and multimedia framework that can decode, encode, convert and stream video/audio files into different formats. It does sit behind various application software that only act as a GUI to the program, making it as easily as possible to work with this very interesting command prompt utility. However, users complained that FFmpeg won't convert videos to H.265/HEVC correctly, and don't know how to solve. Let's find the solid solutions in this post. In fact, FFmpeg has support for H.265/HEVC encoding using the ​x265 encoder. x265 can offer around 25–50% bitrate savings compared to H.264 video encoded with x264, while retaining the same visual quality. However, FFmpeg needs to be built with the --enable-libx265 configuration flag and requires x265 to be installed on your system. If not, FFmpeg won't transcode and encode videos to H.265/HEVC correctly. Another easy solution for you, is to find some best FFmpeg alternative program that can transcode and convert videos to H.265/HEVC MP4, MKV formats in clicks. Here, Brorsoft Video Converter Ultimate for Windows /Mac an optimal H.265/HEVC encoder and converter is highly recommended with below features. Convert virtually any video/DVD/Blu-ray files to all popular video/audio formats like H.265/HEVC, H.264/AVC, MP4, MKV, MOV, MPEG-4, AVI, WMV, FLV, 3GP and more. Install and launch the best H.265/HEVC video converter, simply click Load File to load your videos to the program. Here, Blu-ray/DVD disc and common videos are supported well. 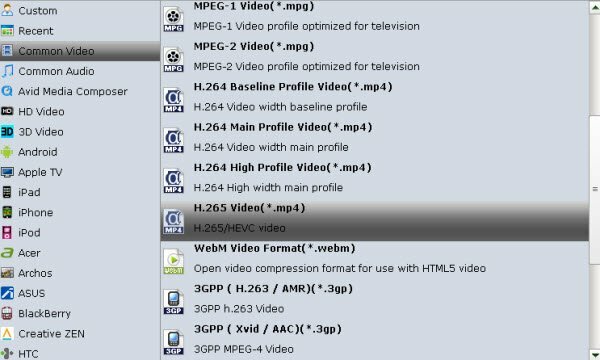 Hit the "Format" box and select "H.265 Video(*.mp4)" from "Common Video" profile. If you want to keep 1080p resolution, choose them in "HD Video" profile list. Tip: If you like, click "Settings" button right besides "Format" and enter "Profile Settings" panel to adjust video size, bit rate, frame rate, sample rate and audio channels. After all necessary settings, click "Convert" button to transcode and convert videos to H.265/HEVC with best FFmpeg alternative. Note that High codec H.265/HEVC will output much sharper video quality, but the conversion time will also relatively longer than common codec.